To most people, it looks like just a rally. Several times a day, in rural outposts across Iowa, a local notable warms up the audience with a story, maybe the one about Bill's marriage proposal to Hillary. The senator bounds onto the stage, pitches her candidacy and concludes by working the rope line until the crowd of several hundred thins out to a few dozen. In what Clinton's campaign believes will be the key to breaking out of a three-way race with John Edwards and Barack Obama, the primary focus at 10 stops this week in Iowa was not on stagecraft or even the very famous candidate on stage. It was to get commitments from potential caucus-goers - or at the very least the names, cell phone numbers and interest level of every man, woman and (voting-age) child who came to listen but will now likely be contacted repeatedly through January. Clinton may be ahead nationally, but in Iowa, she remains far from sealing the deal. And here that means the unglamorous political grunt work Iowans have always expected. "We know we have a lot of work to do," said Teresa Vilmain, a longtime Iowa political operative who is Clinton's state director. Iowa is about organization, locking in supporters in 1,784 precincts who will literally stand up for Clinton in a roomful of their neighbors on caucus night and try to persuade others to join them. This is all very new for Clinton. Her husband bypassed Iowa in the 1992 presidential campaign - favorite son Sen. Tom Harkin (D-Iowa) was in the race - leaving her to build a political network from scratch. By comparison, she got a late start. Edwards never left the state after his second-place finish in 2004, and Obama, who lives next door in Illinois, has already surpassed her in field offices. Clinton began organizing in the spring. The way up, as her campaign sees it, is through mobilization and what her aides call "Aha!" 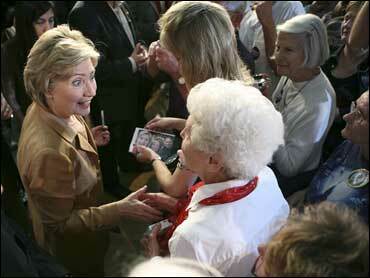 moments - the realization from voters after meeting her that her edges aren't so sharp after all. At every stop, she tries for both. Clinton arrives at least 15 minutes before she's scheduled to speak and withdraws to a private room, where Iowans identified as key community organizers wait to hear why they should go with her. She repeats the drill afterward with a different group. Her volunteers and staff surround the crowds like sentries, handing out and collecting pledge cards. The campaign doesn't release its rate of return, but Vilmain said that at a town square rally in Marshalltown, 300 cards were collected. "Whenever 300 people in one hour sign up, that is success," Vilmain said. Between visits, Clinton's staff goes down its checklist. By the end of the summer, Vilmain said, they signed county coordinators, held 99 county organizing meetings, called thousands of homes and recruited "Hill-Leaders," who pledge to bring in 10 more people to caucus for Clinton. Interviews with more than two dozen voters this week found many of them undecided, torn by a strong field of contenders, sentimental favorites and the desire to go with a winner. When asked how Clinton could land their support, the answers were as disparate as the polls themselves. "She needs to pay more attention to moderates and independents than hard-core liberals," said Dale Evans, 53, a factory worker from Cedar Rapids. But he still likes what he sees. "I talk to some people - men - and too many say she will not get their vote," said Linda Whittle, 63, a postal worker from Cedar Rapids, who considers Clinton her second choice after Sen. Joe Biden (D-Del.). But she still thinks Clinton can win. "I'm not that excited about Hillary Clinton at all," said Bruce Kelly, 59, a teacher at Des Moines AreCommunity College. "She is competent and knowledgeable, but do her negatives create a situation where she will bring out all the evangelical, right-wing Republicans and she will lose?" But no, he hasn't ruled her out. So for now, Evans, Whittle and Kelly will wait. They need to be convinced. They say they will listen to her, and the others, a few more times. They will watch to see what kind of organization she builds, what kind of money she raises and which positions she stakes out. "I can't fault a single thing she has said," Carrie Barr, a 52-year-old stay-at-home mom, said after listening to Clinton in Marshalltown. Barr received three recorded phone calls - one from Clinton, one from the wife of former Iowa Gov. Tom Vilsack and one from a local Democratic volunteer - reminding her about the rally. "She has done everything right," Barr added. But don't lock her in. She's undecided.